Nowadays there are loads of beautiful fonts available for websites and blogs. But how do you go about the technical nitty gritty of adding them? And once they’re added, how do you make sure that the right parts of your website use the right fonts? This step-by-step guide is aimed primarily at WordPress users. However, you can use a similar approach for other types of website. How to do this depends on the font you’ve chosen. If you’re using a font library like Google Fonts or Adobe Typekit, this is very straightforward. But even if you’ve bought or downloaded a font from some other source, it needn’t be daunting. Just follow the instructions below for Google Fonts, Typekit or other fonts. Google Fonts has more than 700 different fonts which you can use – free – on your website. If you’re using WordPress, the simplest way to add these is to use one of the many Google Fonts plugins. Alternatively, you can copy the code snippet provided by Google Fonts into the ‘head’ section of your website. There are already loads of great tutorials about how to do this, so I’m not going to reinvent the wheel. Try this tutorial or follow the Google Fonts documentation. Similarly, Adobe Typekit contains over a thousand fonts, including a limited selection (over 100 fonts) that are available free. As with Google Fonts, there are plenty of Typekit plugins to make this simpler for WordPress users. Alternatively, see Adobe’s instructions for how to do it. But what if the font you like isn’t in Google Fonts or Adobe Typekit? Perhaps you’ve bought a font, or have downloaded a free one. 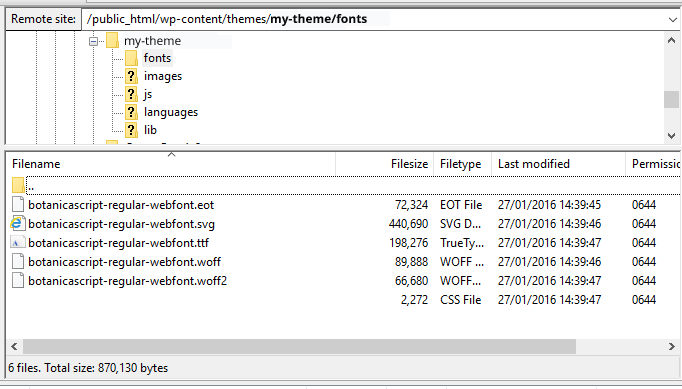 Now you’ve got a zip file full of files with weird names like mynewfont.woff, and no idea how to use them! There are just two things you need to do: upload your font files, and create a font-face instruction which tells your style sheet where to find these files. It’s best to use an FTP programme like Filezilla (PC) or Cyberduck (Mac) to do this. Or you can use the file manager in your web hosting control panel. Upload all your custom font files to this directory. Use the @font-face command to import the fonts to your stylesheet. In most cases you’ll have a number of different files for your font. This is to make sure it works on as many different browsers as possible. You need to tell your stylesheet where to find the fonts, and which file types are available. In WordPress, your stylesheet will be called style.css and can be found in the /wp-content/your-theme/ folder. If you’re using different web software, check your theme or template files for a file ending with ‘.css’. You will need to replace ‘My New Font’ with the name of your font, and make sure that the URLs match your actual filenames. If you don’t have all these different file types, just delete the relevant line. If that seems a little alarming, don’t panic! Font Squirrel has a lovely tool which will generate this code for you. If you’re copy-and-pasting your font-face code, make sure that your straight quote marks don’t get converted to curly quotes, otherwise it may not work. 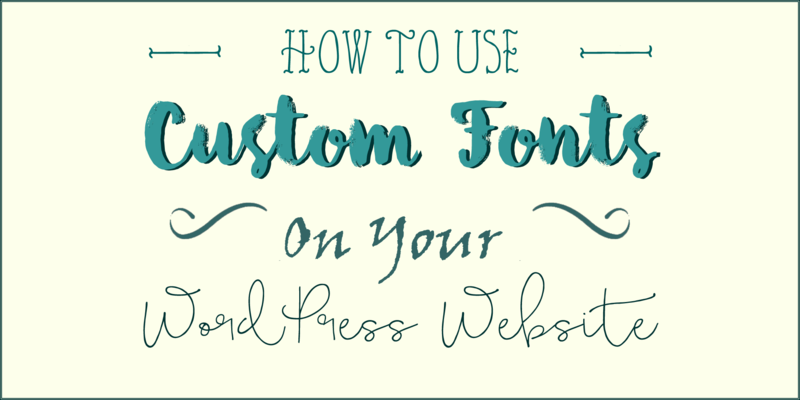 OK, so your fonts are all set up and ready to use, but how do you tell your website to use them? And how do you get the right bits of text using the right one of your lovely new fonts? The answer is CSS, or Cascading Style Sheets. Almost all modern websites are built using CSS to define the styles used for your website – from the layout to colours and, of course, fonts. The principle behind CSS is that all styles are inherited, until they’re over-ruled by a more targeted style. CSS will check all rules that apply to a specific element (e.g. an image, a link or a paragraph). It there’s a conflict, it will prioritise them according to which is most specific. If they’re exactly the same, the one that comes last will be used. TIP: If you’re using WordPress, you may not need to edit your theme stylesheet at this stage. Usually you can add extra styles via the Customiser, which is easier and will give you hints if you type the styles incorrectly. Look for the Additional CSS or Custom CSS section and add your new CSS there. Let’s say you want all of the text on your whole website to use a sans-serif font called “Cloudy Day”. (Disclaimer: I have no idea whether such a font exists). Note that the font name within the inverted commas must exactly match the font name used in your @fontface instruction or in your Google Fonts/Typekit set-up, including any capitalisation and spaces. This command tells your website that the default font for all body text (i.e. everything) should be the Cloudy Day font. Or, if the browser can’t load the Cloudy Day font, then to use Arial. Or, in the very, very unlikely event that the browser can’t even display Arial, then to use its default sans-serif font. But what if you want to use a different font, let’s call it ‘Windy Day’, for headings? I’ve assumed that Windy Day is a serif font, so in this case I’m using ‘Times’ and ‘serif’ as my fallback fonts. When it reaches a piece of heading text, the browser will now spot that there’s a more specific font style for headings and apply that instead of the style for ‘body’. You can use this same principle throughout your website. How do I change the font for this bit of text…? It can be tricky for beginners to work out how to target a particular bit of text with a different style. Fortunately, browsers such as Chrome, Edge or Firefox have tools to make it easier. 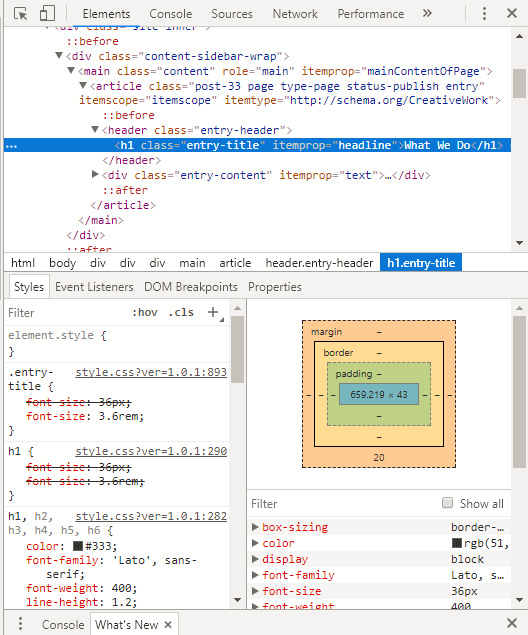 You can view the code by hovering your mouse over the element that you want to target, then right clicking and choosing ‘inspect’ or ‘inspect element’. Let’s say I want to change the WordPress ‘Entry Title’ (i.e. the title of a page or post). Now that I know what CSS already exists, I can add a targeted bit of CSS to overrule it. For this example, I’m going to use a new font called ‘Air’. As another example, let’s say I want to use my ‘Air’ font for all the headings, but only on blog posts. This time, I need to find a selector that applies to all blog pages (but not other pages). You may notice that this is a little different to the way I combined a class with a header before. That’s because of the way that the HTML is structured. Obviously I could give many more examples but the best way to learn is to try it and find out for yourself. Remember to do this on a copy of your website, not the live website itself! For more tips, try this back-to-basics beginners’ guide to CSS. A final tip: Clear the cache! Sometimes you’ll change your CSS but the font (or whatever property you’re changing) will stay stubbornly the same. This might be a problem with your CSS, but sometimes it’s simply because you’re looking at a cached copy of your web page (i.e. a copy saved by your browser or server). As you can imagine, it can be very frustrating to spend ages trying to fix code that isn’t broken! Use the code inspector to check what CSS is being applied. If the changes you’ve made aren’t showing in the code inspector, it’s likely that the page is being cached. If so, the first thing to try is a ‘hard refresh‘ of the page. Depending on your browser, you may need to press CTRL + F5, SHIFT + F5, CTRL + R (Windows) or CMD + SHIFT + R (Mac). If that doesn’t work, check whether you’ve got a Caching plugin on your website. Many will have a ‘clear cache’ setting. Sometimes your web hosting company will cache the page, and you may be able to clear this via your hosting control panel. If all else fails, try using a different internet browser. If none of that works, it’s likely that you haven’t managed to target quite the right selectors so you’ll need to go back and try again. Are there any other topics you’d like me to cover in a tutorial? If so, please let me know either by leaving a comment below or by using the contact form.